Last Thursday night, the Dallas Police Department (DPD) used a bomb disposal robot with lethal force. After hours of negotiations failed, the police strapped 1lb (450 grams) of C4 and a detonation cord to the robot, manoeuvred the robot near the suspect, and detonated, killing the 25-year-old suspect Micah Johnson. In a police statement issued on Saturday, the DPD named the bot used in this unprecedented operation: the Remotec Andros F5 model. 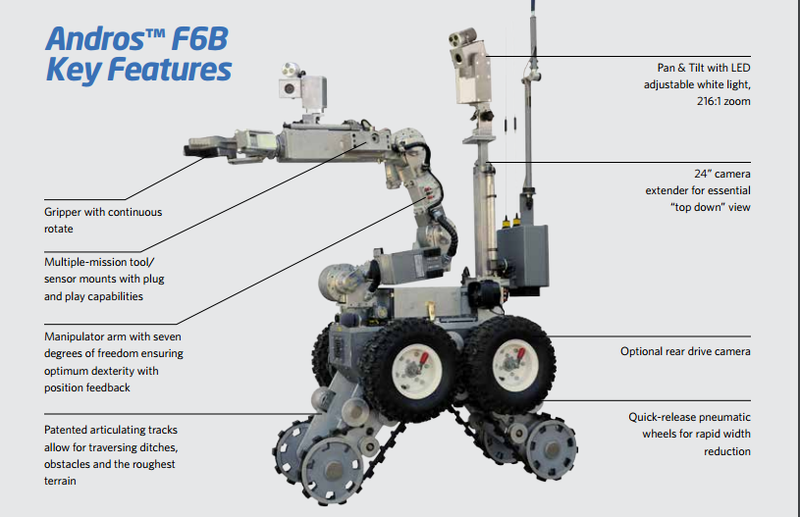 Although no longer sold by Remotec, the F5 appears to be an earlier model of the current Andros F6 bomb disposal robot. According to a 2012 product sheet, the new F6B can carry up to 60lb (27kg) with its arm fully extended, meaning its 1lb (450 gram) lethal payload wasn’t even close to the maximum amount it could carry. Remotec calls the F6 “the most trusted and reliable system for unmanned first response”. Original reports suggested that the robot used in Thursday’s operation could have been a Marcbot, a simpler robot which had previously been used in a similar, improvised way by the armed forces in Iraq. But where the Marcbot weighs about 30lb (13kg) and is little more than a remote-controlled car with an extension arm, the Andros F-series has a Swiss Army knife of emergency features, including a manipulator arm, gripper, and a 24-inch (60cm) camera extender. It weighs a backbreaking 490lbs (222kg), but can easily climb stairs thanks to its treads. This likely came in handy as the Dallas shooter was cornered on the second floor. In the few days following the heart-wrenching events in Dallas, a debate is stirring on how to handle this new use of police force. In the new statement, the DPD says the robot was used as a “last resort” in order to save the lives of additional officers and civilians. Other police agencies like the NYPD have praised the DPD for its unprecedented use of a bomb disposal robot, according to The New York Daily News. Legal experts, however, raise concerns about the unmanned aspect of lethal police action, comparing the use of exploding robots to drone warfare. The debate will likely continue in the coming days, weeks, and months, and the Remotec F-series will be the robot at the centre of it all.